In my deliberations about buying a stone, I searched about for cheap alternatives. I had read on recipe sites and message boards about using cheap quarry tiles to approximate the effect of a pizza stone. While Jason’s cast iron skillet is free for me to use, it can only produce pies that are a bit over 9″ across (smaller than I would probably even eat by myself). I have $5 to lend to a pizza experiment, so I decided to pay a visit to Home Depot. 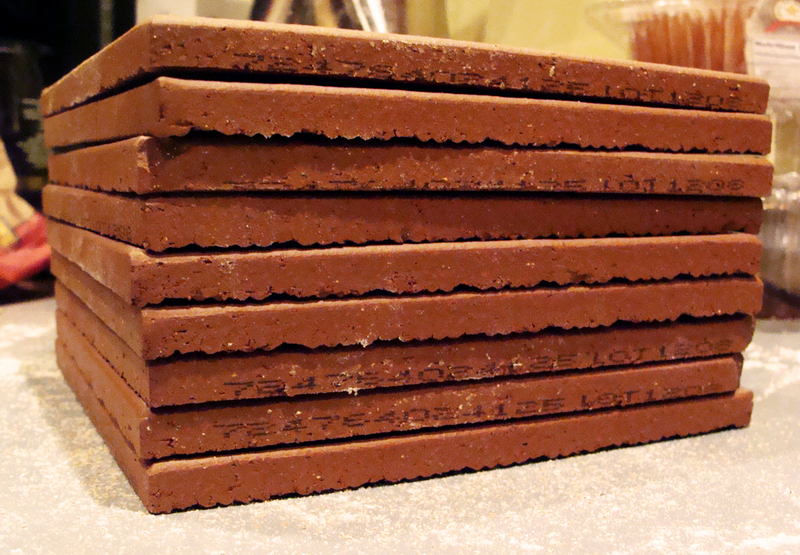 Our heroes, a stack of slabs. Of course Slice has put these tiles to the test already. I had even heard of some enthusiasts going beyond replicating a pizza stone out of the tiles, and instead lining their oven with them. This fellow built a kind of mini-oven in his oven. This all gave me confidence for my own experiment, despite some noted shortcomings. The tiles don’t present a solid surface to the pizza, so some mess can drip through the cracks onto the oven floor. 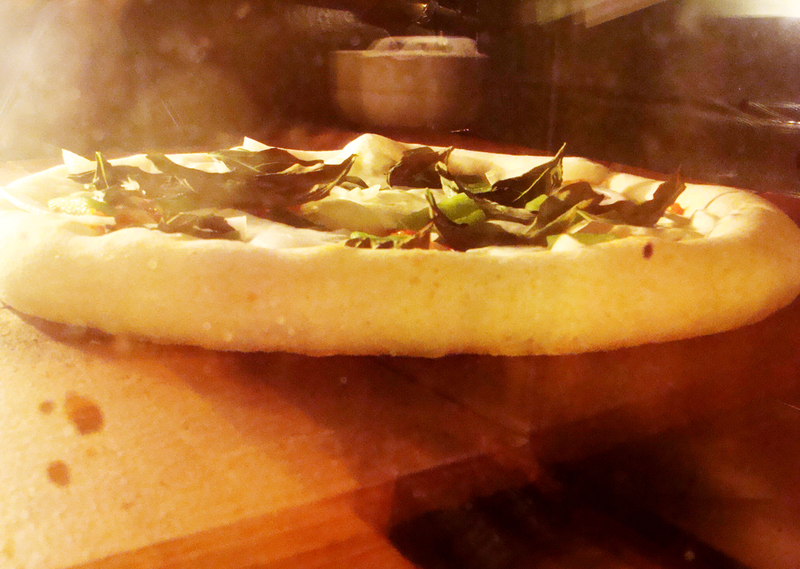 Additionally, shifting and small tiles can present some difficulty in positioning the pizza as it goes into oven. The only tiles I could find at Home Depot were 6×6″, which had me worried about whether I’d be stuck with a 12×12″ “stone” that would be difficult to position a pizza on. 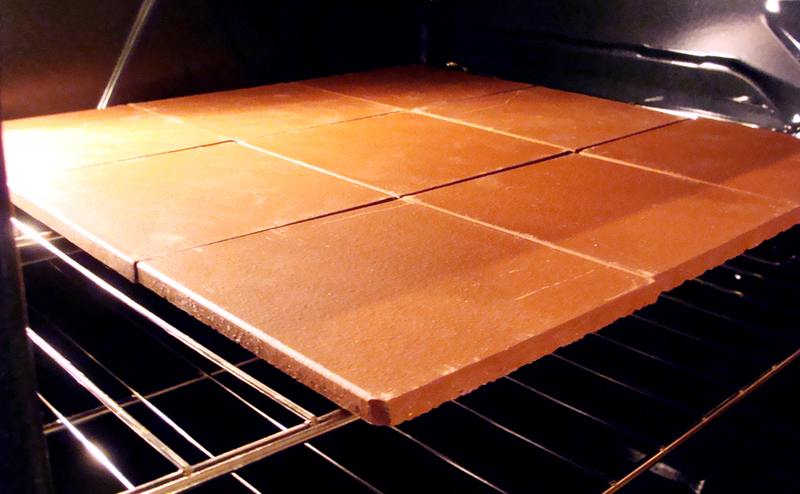 I took the chance and picked up 9 tiles, and fortunately found that I could fit all 18 square inches in the oven. The total was indeed under $5. It’s a tight squeeze, even in my relatively spacious oven. I followed the dough recipe in my experiment using a cast iron skillet, although I reduced the sugar to just 1 tsp. I used the same batch of sauce from that night. Once the dough had proofed and the stones had preheated in the 550 degree F oven for an hour, I started to assemble and bake my pies. I slid a baking sheet on the rack below the stones in order to catch any drippings in the case of an accident. Sure enough, one of the pies folded as I slid it onto the stones, although nothing leaked through the cracks. However, I still found much easier to slide the pizzas from the baking sheet to the tiles compared to the cast iron skillet, and I had no problems with stones moving around. Real oven spring pizza action! The pizza itself came out much better than it did in the skillet. While the crust didn’t char like it did on the stove, it came out crispier, chewier, and airier. 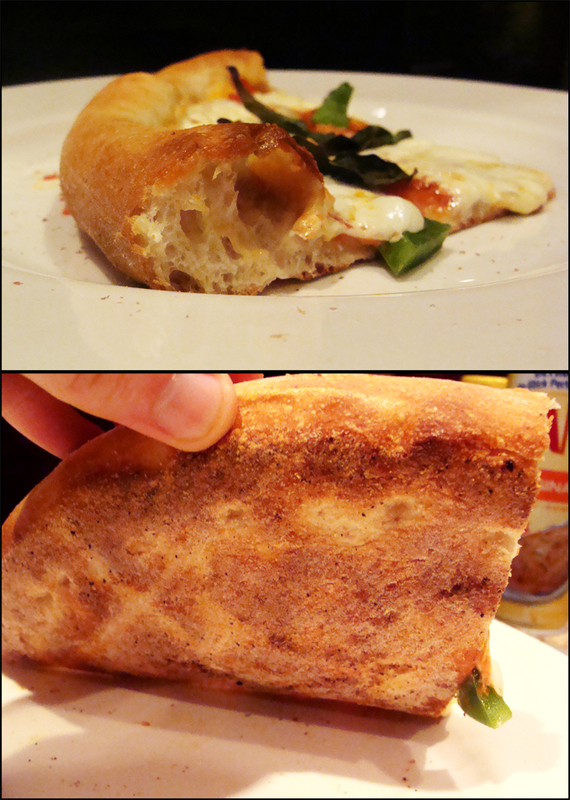 Even with how thinly the dough was stretched in the middle, each slice had solid structural integrity. You can see that the holes in the dough are much larger, but still well connected by a network of gluten. Also the bottom of the crust, while not charged, is mottled. With a slightly longer bake time the crust should get even crispier, and perhaps char in some spots. This is the best crust I’ve made so far. The simultaneously chewy and crispy texture extended throughout the entire slice. Click the picture to admire at higher resolution. This is probably the best pizza I’ve made so far, but I don’t plan to stop here. There further experiments to do with dough and sauce recipes as well as toppings. As you can see, I’ve added back in onion and green pepper, but I’m eager to try some marinate seitan again. Of course there are also other types of dough to try. Colleen and I both greatly enjoy the cracker crust, and with these tiles I’m excited to see how such a crust would turn out. My conclusion on these tiles are that they do really make the difference that lead my brother to insist that I must get a stone. The tiles deliver great value at only $5 for 18 square inches at a quarter inch thick, or 12 square inches at a half inch thick. They work so well that I currently don’t have plans to upgrade, though there are a few surfaces that I still have on my mind. For now I think the tiles will be my surface of choice, although the cast iron skillet will probably be revisited in the future when I don’t want to preheat the oven (which can raise the temperature of the fermenting beer in my bedroom) and to see if I can get a better balance between char and fully cooked pizza (the tiles cooking but not charring ideally, and the skillet charring before fully cooking the dough). This entry was posted in equipment, experiment, learning, pizza on February 15, 2013 by Dylan Bargteil.